Jewelry Design Gallery is your full-service jewelry shop for watch repair and watch battery replacement. 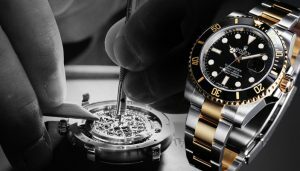 We service all watches from Rolex, Cartier, Breitling, Michele, Movado, Seiko, Tag Heuer, Citizen, Raymond Weil , Chopard and more. 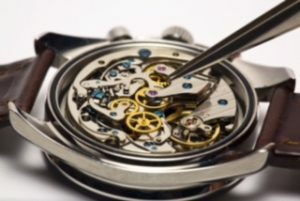 Looking for watch repair? You’ve come to the right destination. You can count on us for any of your watch repair needs or even to find perfect replacement watch bands. You can come in and drop off your watch for repair OR if you are out of town, we will email you a UPS shipping label that you can mail your watch to us for repair. Expert watch repair for over thirty two years for every single watch brand there is! To keep your watch in excellent condition, it is highly recommended to have it examined by our master watchmaker every three to five years. Why? Well, every watch produced, consists of over 200 parts—all working in unison! The tolerances of these parts are measured in microns (thousandths of a millimeter), and the day-to-day movement of these parts cause friction. 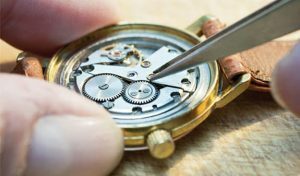 In order to keep your watch in high-caliber working condition, it must be examined and serviced by a master watchmaker. Whether it’s a simple crystal replacement, cleaning or complete movement replacement, let our 32 years of experience go to work for you! Call us at 732-536-1184 for expert watch repair, watch battery replacement or replacement watch bands or visit us today for a free estimate in the Towne Pointe Shopping Center in Manalapan New Jersey!